Silver Reading includes your one question to ask. This is ideal if you have a specific question to ask. Gold Reading includes your three questions to ask, whether you need answers on a specific situation or concern, or would like a general reading on the next 6 months. Some people prefer these readings as they are not required to be in the room with Mark. Consequently there are no distance issues and the emails are detailed as if you were in the room with Mark himself. Currently Mark has completed email readings Worldwide with outstanding results and accuracy. Email readings will be responded to within 72 hours excluding weekends and bank holidays. How do I book an email reading? Simpy choose from one of the three packages shown on this page and complete the form and payment. Payment options are via paypal (you do not need a paypal account) or via EFT. If you prefer EFT payments then please complete the form and then send payment one I send you confirmation of your reading request. Do you do Phone or Skype readings? Sorry No. If you are looking for a phone reading then you will need to consult alternative readers. A number of reasons. Some people prefer it this way, but often its more to the restrictions on distance where you would need an email reading from myself. When do I get my reading? Within 72 hours (excluding weekends and public holidays) of the confirmed, cleared payment. 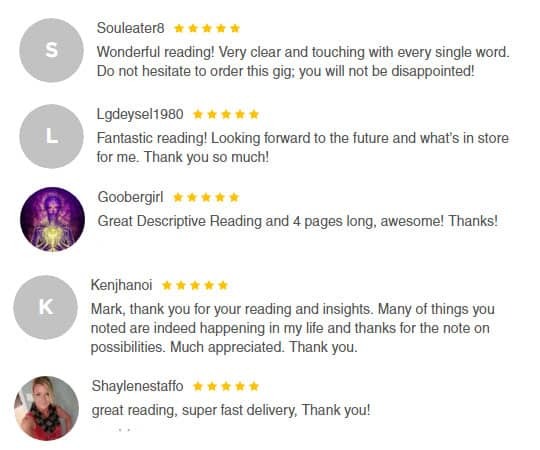 A small selection of clients who have had an email reading with myself. Book your GOLD email reading now! If you would like to get started then please complete the following form below and click on the “buy now” button.